Over 50% of the money we raise each year to support our work comes from private sources — donors like you. By giving now, you’ll help save lives tomorrow. For as little as $25 a month, you can provide the equivalent of three mental health counseling sessions for someone in crisis, or five HIV tests for people unsure of their status. Many of our supporters donate to AIDS Action to honor someone living with HIV, to pay tribute to someone who has passed away, or to show their support for family and friends whose lives have been impacted by the disease. By giving this way, you have the option of notifying someone of your gift via a personalized message AIDS Action delivers on your behalf. To make a gift in honor or memory of someone, just click the “Yes, this is an honor or memorial gift” button when completing the donation form and you will be prompted to enter that information. Your monthly gift– made via credit or debit card – provides a reliable source of funding for our ongoing work, giving you the satisfaction of knowing that your gift touches lives each and every day. Gifts as small as $10 per month add up to $120 per year. For $25 per month, you join our Circle of Friends, providing $300 a year for critical programs and services. To put $300 a year into perspective, that’s three one-on-one mental health counseling sessions for someone in crisis, or 5 HIV tests for people unsure of their status. Give $100 per month, and you join our Red Ribbon Circle, with benefits throughout the year. To make a recurring monthly gift, just select the “Sustaining gift” gift type when completing the donation form. 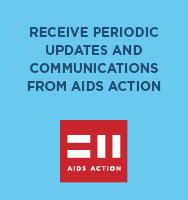 Many companies will match your gift to AIDS Action Committee, which will double or triple the value of your gift depending on your company’s program. To find out the guidelines and instructions for applying for a matching gift, contact your Human Resources department. Questions about matching gifts? Contact sglasser@fenwayhealth.org or at 617.450.1520. If you would like mail in your donation, please use the address listed below. Checks should be made out to AIDS Action Committee.